Do you have a favorite piece of cookware? Mine is definitely my beautiful, black, oval Le Creuset Dutch Oven that my husband bought me for Christmas a few years ago. 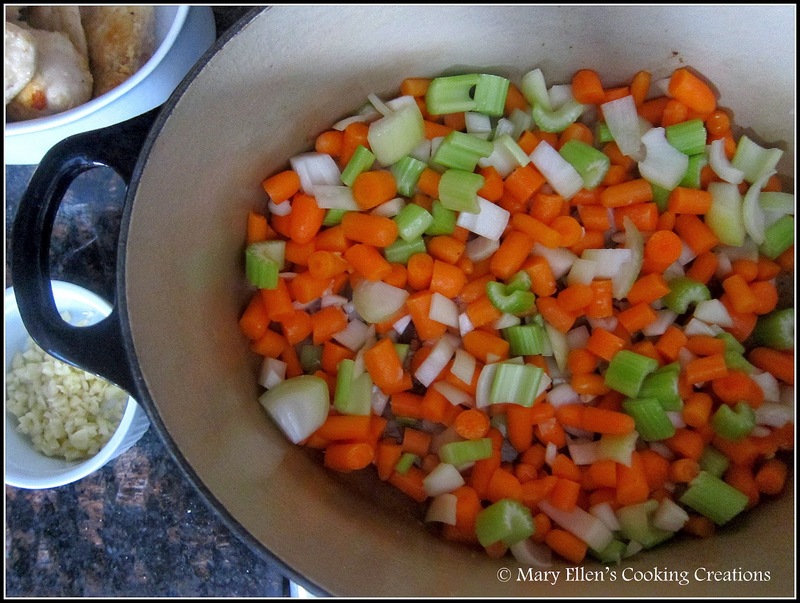 I use it for soups, stews, braising meats, one pot meals, and even baking crusty bread. I'll also convert crock pot recipes to stove top just because I prefer cooking in my Dutch oven. I don't know what I'd do without it, honestly. 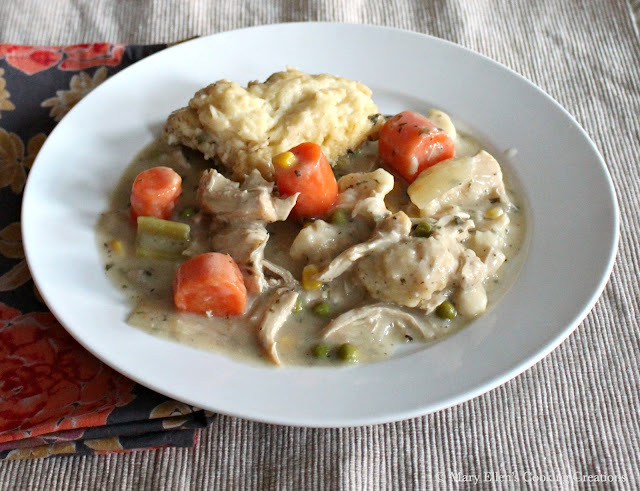 Last weekend I cooked something amazing in my Dutch oven - Chicken and Dumplings. Until that day I had never had this dish before. I have had creamy chicken soups, chicken pot pie, and braised chicken dishes, but never this wonderful Southern meal of chicken and dumplings. I have several recipes in my blog queue waiting to be posted, but once I made this one I had to jump the line and share it immediately, it was THAT good. 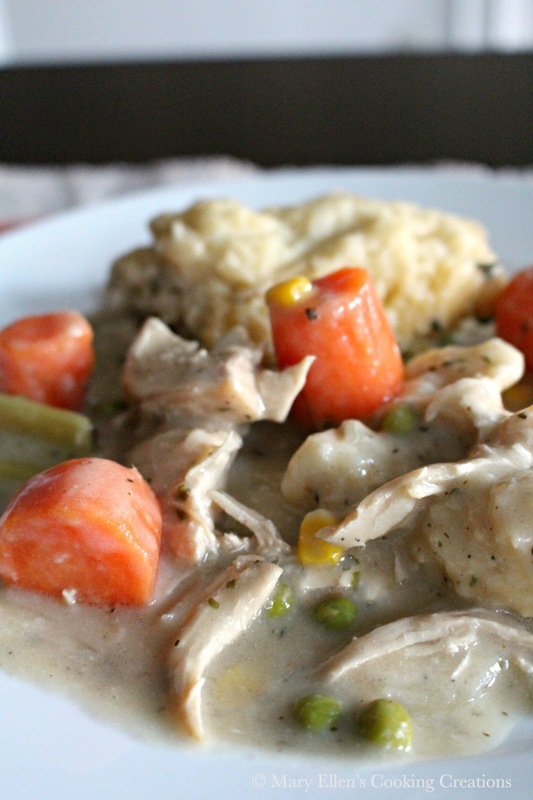 Hearty, comforting, savory, and all cooked in one pot, even the dumplings. 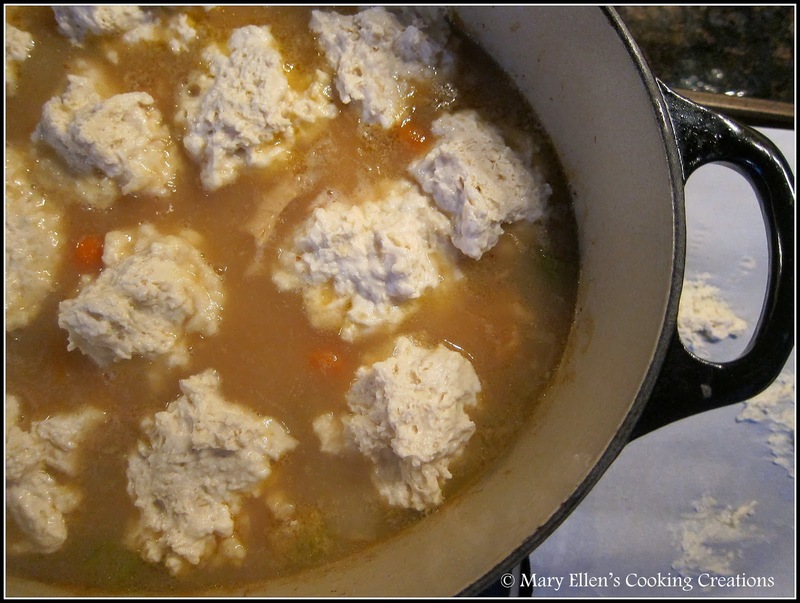 I have made steamed dumplings like that before in a beef stew, so I knew to expect light and fluffy dumplings, or what my daughter called "pillows." Although this meal takes about 75-90 minutes to come together, the preparation and method are both easy. 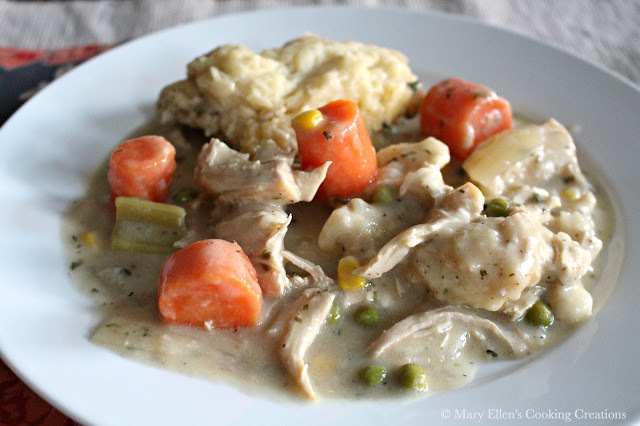 Basically you brown you chicken, add the veggies, and then let everything simmer so a thick gravy can develop. Once you shred your chicken, the dumplings are the last thing you cook, dropping them into the pot on top of the chicken, and letting them steam for 15 minutes. Above - just after dropping the dumplings. Below - after steaming for 15 minutes. I think "pillow" is the perfect word for them. I made a few changes to the original recipe, so my adaptation is below. I used chicken breasts because they were what I had on hand, but I think a mix of white and dark meats would be really good. This recipe made a lot - 5 of us ate on Saturday, and 3 of us ate it on Sunday. Oh, yes - the leftovers are really good!!! Add the wine followed by the broth. Stir will to dissolve the flour. Add the bay leaves, sugar, thyme, parsley and peppercorns. Return the chicken to the pot. Cover and turn heat to low and let simmer for 20-25 minutes until the chicken has cooked through. Once the chicken is cooked, shred it. I like to do this using my KitchenAid mixer - 2 breasts in the mixer on speed 2-3 for 15-20 seconds will give you loosely shredded and somewhat chunky chicken. Keep it in longer if you like it shredded more. Alternatively you can shred the chicken with 2 forks. Once it is all shredded to your liking, return it to the pot and add the peas and corn. Let simmer while you prep the dumplings. Make the dumplings: mix the flour, baking powder, and salt in a bowl. Add the butter and about 1 c of the milk and stir with a wooden spoon. It should be dry and somewhat sticky. If it is too wet, add flour; if it is too dry, add milk. 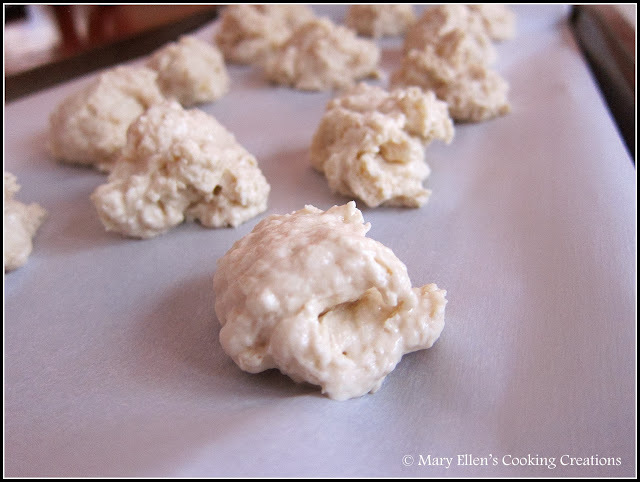 Spoon 1-2 inch dumplings onto a sheet lined with parchment paper OR if you work quickly, spoon them directly into the pot. 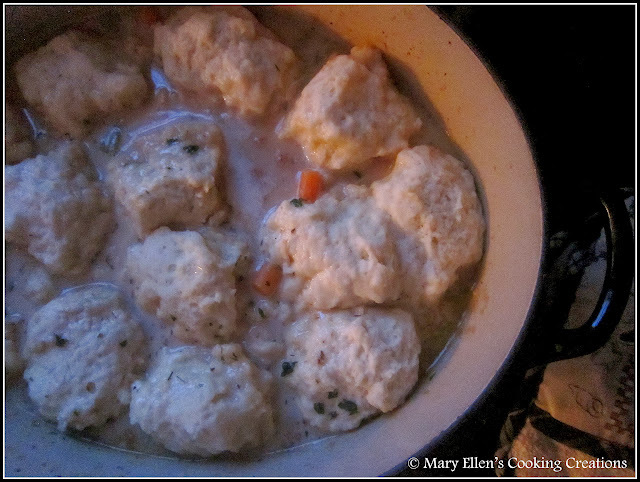 Place all of the dumplings in the pot, cover, and let them steam for 15 minutes. Remove the lid and gently stir in the cream. Adjust salt and pepper and serve immediately. I can't wait to make this - it sounds incredible!